Having been at both AUSA and the Intel Federal Summit, it became clear to me – if it wasn’t already – that autonomy is not only here to stay, but that robotics and autonomous systems will no doubt change the face of the defense industry across all branches and domains. But: what does this mean for Abaco and our products? Autonomous applications will range from robotic pack ‘mules’ and logistics resupply convoys, swarms of aerial, amphibious and ground drones/patrols and ultimately human-machine teaming using natural speech commands. Deployments are planned over the 2022-2035 timeframe across all branches. In the near-term, autonomous capabilities may be retrofitted to current platforms, but more advanced applications will require re-architected, next-generation platforms with greater agility and functional density. An overriding goal is to send unmanned, teaming devices into threat areas to provide intelligence and, in the worst case, be exposed to weaponry. A common rejoinder I heard at both AUSA and the Intel Federal Summit was: “let the robot die first”. These autonomous systems will have a great dependence on AI, machine learning and deep learning via neural networks. Much of the current work applying AI is in perception. However, AI will also play a dominant role in the collaborative behaviors and ‘social’ adaptations of these platforms under combat conditions. There is simply no way for human beings to remotely control, in real-time, the individual actions of large swarms in chaotic, visually degraded situations. Hence the need for “Robert’s Rules”* for robots. As we also see in the autonomous vehicle industry, there is a lot of discussion around how to manage AI-based software that is designed to evolve over time based on individual and shared experiences. Similarly, in the military, there is serious concern over how to validate and maintain confidence in software that is designed to modify itself in the field. The military is historically devoted to determinism, so agile development terms like ‘fail fast’ don’t fall easily on the ears of commanders! To deal with this challenge, DARPA has launched two autonomy research programs – and I’ll be reviewing those in the second part of this post. * For the benefit of our international readers: Robert’s Rules is the most widely used manual of parliamentary procedure in the United States. It was developed to enable many organizations – such as including church groups, county commissions, homeowners associations, non-profit associations, professional societies, school boards, and trade unions - to have a common basis for how they operated. Kevin joined Abaco Systems in January of 2017 as Business Development Director focused on the autonomous market. 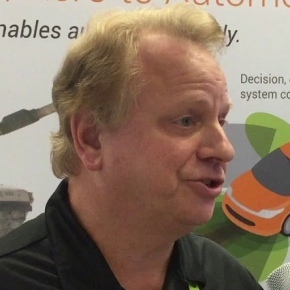 He has over 20 years of experience in intelligent and connected vehicles and systems, with an engineering degree from the University of Michigan.